No matter how many Ad companies or options available, still Google AdSense is the most popular monetization methods for website owners. To make the things easy, few WordPress themes come with inbuilt Ad Optimisation units. But all these themes has no clue how to deal with AD Blockers as people recently avoiding the display of ads in their browsers. MyThemeShop has released its brand new “Ad-Sense Premium WordPress Theme” to combat with this issue of Ad blocks. What exactly Ad-Sense Premium WordPress Theme do? As discussed above, it is tough to reach visitors or audience who have got their browser’s inbuilt with Ad Blockers. You have no chance to display ads to such visitors and all your efforts in placing the ads inside and outside of the content is in vain. Ad-Sense Premium WordPress Theme will ask the reader with a popup asking him/her to disable the Ad Blocker in a smart way. This popup will ensure that the visitor is given a choice to deal with the ads instead of complete blockage as seen in other themes. Every one of us knows that many of the online business owners including many of the bloggers are designing their blogs, especially for Adsense income. If they can’t penetrate or slide through Ad Block a headache, there is an enormous impact on their earnings from Ad display units. Ad-Sense theme from MyThemeShop is the one that will not only help to overcome this issue, but it has many more flexible features. The Theme Comes with eight types of blog/website Predesigned templates so that you can build a website/blog of your desire. The default template can be enough for a general blog or website. 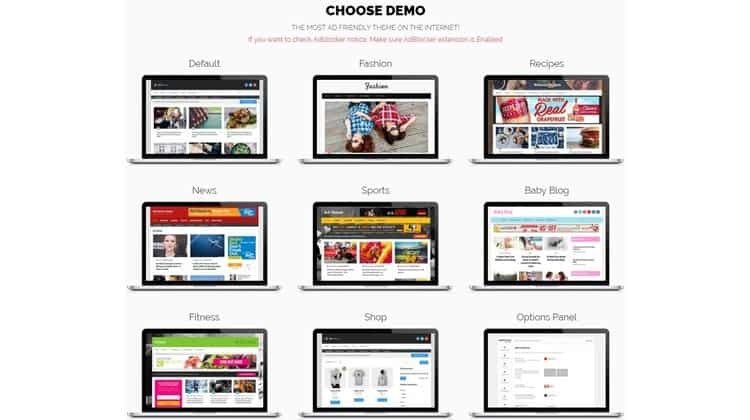 But if you need the specific style for Sports, Fitness, Baby Blog, Recipes, News, Fashion, Ecommerce, you can import that particular demo template. You have the option to import only settings so that you can customise your site accordingly. The other option is, you can download demo data with demo settings and modify the demo content with yours. This Ad- Block detector is the unique feature of this Ad-Sense Theme, where it has an Ad-Blocker Detector software which blocks content for Ad-Block users asking them to disable Ad-block temporarily to access the content. You have the flexibility to display this Ad-Blocker in any part of your site with the option of Shortcode and also few pre-installed popup. As already discussed above, this is an excellent choice for many bloggers who are losing their Revenue due to Ad Blocks. It is obvious for the Money Making sites or sites that are designed to earn income from Adsense or Amazon or Affiliate Marketing to have a Review Plugin. This Ad-Sense Premium WordPress Theme comes with Inbuilt Review System and thus can save a plugin and page load on your site. Not all WordPress themes will come with inbuilt optimisation of speed. This feature can help you to reduce a few plugins. Most of the MyThemeShop themes come with this facility, though. This another important modern feature where you get the basic SEO things tuned within your WordPress theme. Google loves websites that have got all necessary SEO things done. Many themes have the choice to choose or change default theme colours, but only a few have the unlimited colour option. Ad-Sense Premium WordPress theme is one such theme from MTS that will allow you to put any colour code in colour palette. Typography is another important element in designing or customising a WordPress theme. Most people ignore this thing, but if your client needs a unique styling of fonts and all, it comes in handy. It is very annoying if you do not have an option for an inbuilt Author box in any theme you purchase. In my experience, I tried many themes, and only a few have this option, and all MTS themes have it. The inbuilt Author box option gives you the opportunity to reduce the burden of installing a separate plugin which indirectly reduces a load on the loading page. You need to have a separate plugin to compensate the Social Icons feature for your website. This inbuilt Social Share Icons option allows you to ignore that. With Custom CSS you can make or design your theme at will if you have some coding knowledge. Even without coding, by contacting the support team you can get the code for particular customization things you wish to make in your theme. The Custom CSS is very useful as you don’t need to add any coding directly to your core theme files. After using this theme on my micro niche blogs, I found that this is one of the themes that I am looking for since a few years. It is a great theme to give it a try although there is no such theme to avoid Ad-blocker altogether. 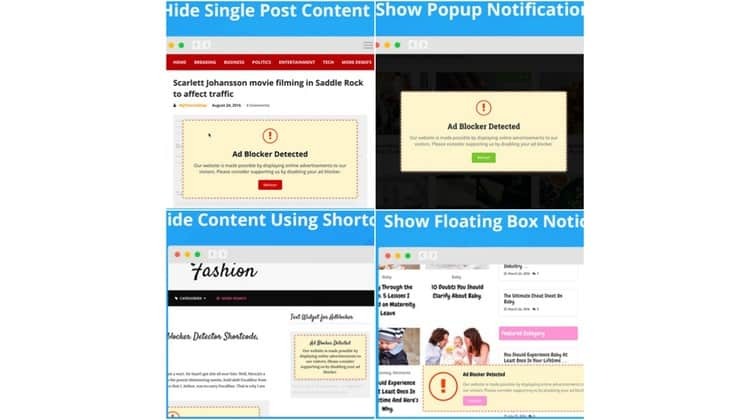 This Ad-Sense Premium WordPress theme can still help you at least give your visitor an option to see or block instead of completely blocking of Ads. If you are looking for a theme has inbuilt Adsense optimised Ad units, Ad-Blocker detector, then it is a great Choice! Google AdSense is one of the most popular methods for monetizing websites, and despite what we may have heard, it can still be an excellent way to support our content production efforts. In order to get the best results, it’s important to try different advertisement strategies. AdSense really offers multiple ad formats from which website publishers can choose. There is a large range of widely used ad formats, such as skyscrapers, leaderboards and rectangles. These banner formats feature both text ads and graphical ads. Affiliate marketing is one of the most popular ways to make money from our website or blog. Eventually, thanks for sharing your additional information regarding this subject. Wow!! This seems to be very interesting theme. I have been looking for such theme. I will make use of it. Great Review. Thanks for sharing this content with us !